00:45:00 Makes 4 servings, 1/4 recipe (338 g) each. Makes 4 servings, 1/4 recipe (338 g) each. Bring water to boil in medium saucepan. Add quinoa; cover. Simmer on medium-low heat 15 min. or until liquid is absorbed. Meanwhile, heat 1 tsp. oil in large skillet on medium-high heat. Add chicken; cook 5 to 7 min. on each side or until done (170ºF), adding 2 Tbsp. dressing to skillet for the last minute. Transfer chicken to plate; top with reserved pan drippings. Cover to keep warm. Add remaining oil, carrots, ginger and garlic to skillet; cook 3 to 5 min. or until ginger and garlic are fragrant, but not browned, stirring frequently. Stir in bok choy; cook 1 to 2 min. or until bok choy begins to wilt. Add remaining dressing; cook 2 min. or until carrots are crisp-tender and liquid comes to boil, stirring frequently. Spoon quinoa onto serving plates; top with vegetable mixture and chicken. Quinoa was a staple of the ancient Incas who called it "the mother grain." Hailed as the super-grain of the future, quinoa contains more protein than any other grain. Serve topped with chopped fresh cilantro. 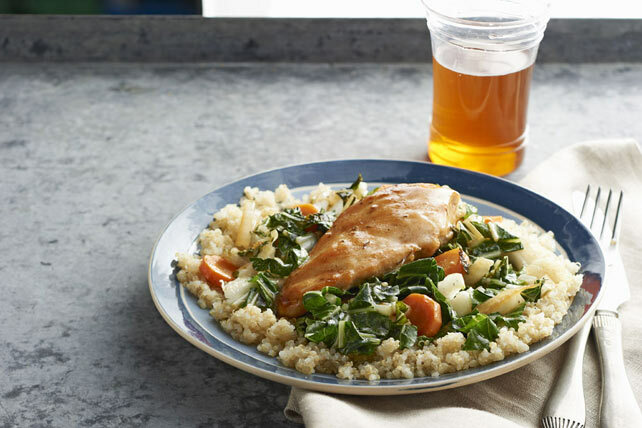 Help your friends and family eat right with this great-tasting meal. As a bonus, the carrots provide both colour and an excellent source of vitamin A, and the bok choy provides an excellent source of vitamin C.
Serving Size Makes 4 servings, 1/4 recipe (338 g) each.